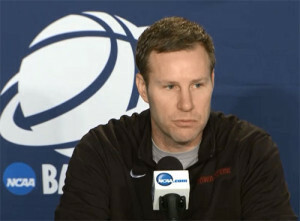 Fred Hoiberg after this year’s NCAA tournament. Fred Hoiberg is expected to be introduced as the new coach of the Chicago Bulls. The 42-year-old Hoiberg has spent the past 5 years at Iowa State and led the Cyclones to 4 straight appearances in the NCAA Tournament. Hoiberg worked in the front office for the Minnesota Timberwolves and always expressed a desire to eventually coach in the NBA. Hoiberg said it needed to be the right opportunity at the right time. Hoiberg called his time at Iowa State’five of the best years of my life”.